Fruit growers of the Nigeenpora, a hamlet in South Kashmir, have been left in the lurch as their apples are falling incessantly prematurely. They don’t understand whether to blame the disease or overuse of pesticides. For the past four years, they are experiencing abscission of apple leaves. It happens well before the fruits ripen. After leaves fall, the apples follow. People say the problem has compounded in the last one and half year. It was not Showkat’s problem alone. Various other Nigeenpora orchards faced the same crisis at the same time. “Before fruits would reach the stage of ripening, brown spots appear on the leaves, which later turns them lifeless and yellow in colour,” One resident said. “As soon as the leaves begin to touch the ground, fruits would automatically fall.’Another apple grower maintains that they are forced to pluck apples at a premature stage as fruits fall on their own and trees acquire a rusty appearance. “It all happens just within few hours, giving us less time to take action,” says Ghulam Mohammad Dar. Not only do these people lose crops of current year but of subsequent years as well as because the trees are rendered weak by the exposure to this infection. For the growers, who are totally dependent upon horticulture, this situation is no less than a catastrophe. “I am wholly dependent on my apple crop. When my crop got affected, I had to call back my son, who was pursuing engineering in Punjab, to help me” says another apple grower. The bigger problem for the growers is that they do not know whom to blame for the recurrent foliage loss. “Abrupt change in the temperature during the summer is one of the predominant reason of leaf abscission in apple trees,” a Research Scholar, at Sher-i-Kashmir University of Agricultural Science (SKUAST) Kashmir. The disease has been around for a long time. But the sort of epidemic in North Carolina (USA) led to scientific investigations in 2008. Caused by Alternaria mali, the researchers established that the fungus survives winter as mycelium on dead leaves on the orchard floor, revives in summer and restarts the damage. Outcome of the American research suggests that the primary infection takes place about one month after petal fall as the disease advances rapidly in the optimum temperature (77 to 86 ºF) and wet weather. At optimum temperatures, infection occurs with 5.5 hours of wetting, and lesions can appear in the orchard two days after infection, causing a serious outbreak. The fungus produces a chemical toxin which increases the severity of the disease on susceptible cultivars. But the growers disagree with this theory. They go with the notion that ‘sub-standard pesticides and fungicides’ are ruining their orchards. “One day while witnessing the bruised conditions of my tress, I immediately rushed to a local pesticide dealer, who gave me a can of pesticide which didn’t work,” Showkat said. “Next day, I went up to him again and sprayed another brand but that too served no purpose.” Dar maintains that though the sprays are duly prescribed by the horticulture department yet they bring us no respite. Arshid Ahmad is a pesticides dealer, who also own few apple orchards, in Kulgam. In last five years, he said, his own crop suffered extensively. “Every year there are complaints from customers that one or the other spray has damaged the crops. Even I am one amongst those,” he maintains. Holding the same view, another research scholar from SKAUST says there are some pesticides and fungicides that can cause premature falling of leaves. “I have personally gone through number of cases where the sprays have caused abscission of leaves,” The scholar who wishes to stay anonymous said. The scholar, however, also believes that sometimes growers, in order to increase the yield, go against the prescribed limits, which acts as a poison for trees. Overdose of fertilizers can also often cause reverse effects, he remarks. Off late, use of chemicals and pesticides has gone phenomenally up. Impact on the apple crop has major consequences for the economy of the state because horticulture is the main mover of the peripheral economy having clear cascading impact on the overall economicwell being of the state. 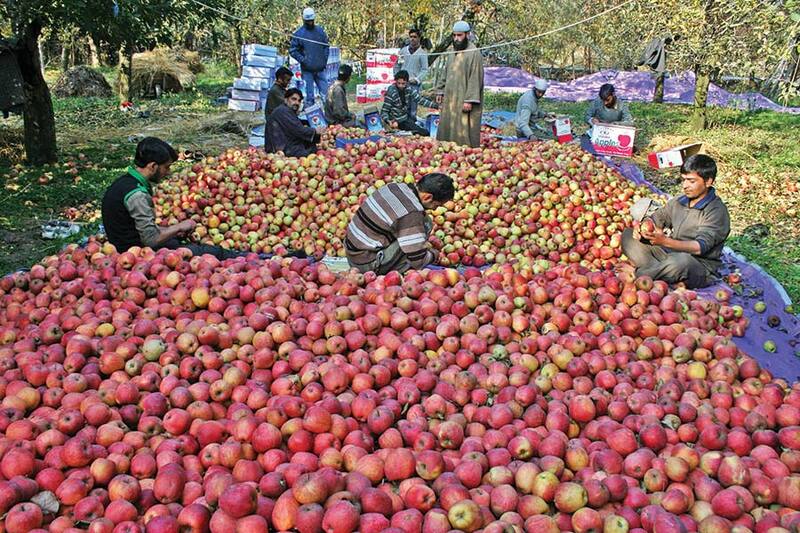 As India’s principle apple producing state, J&K produces average of 11.2 metric tonnes, a season. Almost seven lakh families are directly or indirectly associated with the apple industry. The government has been consistently asserting that it has gone against the sub standard pesticides. In May 2016, Law Enforcement wing of Agriculture Department, Kashmir seized sub-standard pesticides worth Rs two crore in a matter of two months. Terming 2017 as a ‘year of apple’, the Chief Minister is aware of the problems growers face. She had directed police to invoke Public Safety Act (PSA) on all those who selling sub-standard pesticides. But till now not a single PSA was ever slapped on any dealer selling sub-standard material.